Feiwel & Friends, 9781250059079, 40pp. The only thing better than watching Theo the dog (part-Boxer, part-Shepherd, part-Labrador, part-Sharpei) curl up for a nap with his best friend Beau (a two-and-a-half year old toddler) is watching them having a blast together in the bath. The strong friendship, trust and love that was so visible in Naptime with Theo and Beau, is once again on full display in Jessica Shyba's absolutely adorable and unbelievably charming photos. Jessica Shyba, author of Naptime for Theo and Beau, is an eternal urban soul dedicated to capturing as many moments with her family as possible. 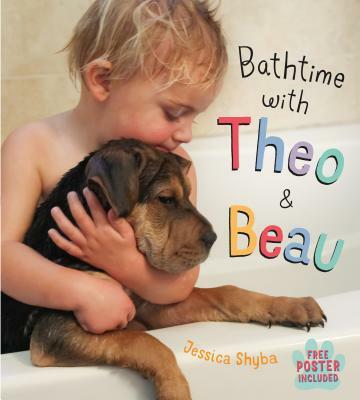 Her beautiful images capturing the friendship and trust between her son Beau and their new puppy Theo touched the hearts of millions of people around the world, and quickly turned the adorable duo into an Internet sensation. She lives in California with her husband, four children, and two pets.